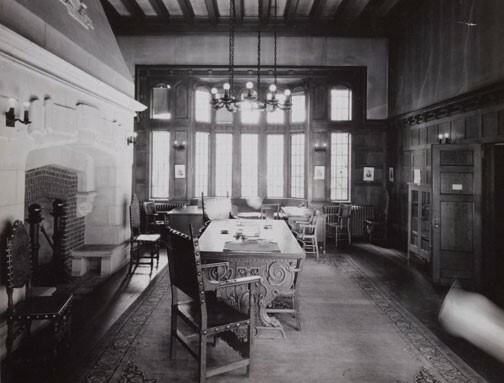 The history of Princeton philosophy goes back to the College's earliest years, long before the present departmental structure was instituted in 1904. To be a philosopher in those days was compatible with being a theologian. It virtually always involved lecturing on ethics and political theory. And it often involved being president of the College. President John Witherspoon, for example, listed as Professor of Theology, was famous for his lectures on moral philosophy. A decade prior to Witherspoon, Princeton had as her president, for only a few weeks, one of the greatest philosophers America ever produced: Jonathan Edwards. Never mind the brevity of the period. It is a feather in Princeton's cap that she was able to lure such a giant, and a matter of great regret that his contribution was cut short by his premature death from smallpox. Witherspoon too was a giant, but in a different way. Edwards's philosophical ideas were stunningly original, though he used them in defense of Calvinistic doctrines that were rapidly losing favor. While not particularly original, Witherspoon was a man of unusual intellectual power. A disciple of Thomas Reid at Glasgow, he brought to Princeton Reid's ``Common Sense Realism,'' when he became president in 1768. James McCosh, who became president exactly one hundred years after Witherspoon, represented the same philosophy. Intellectual histories of the United States use the phrase ``The Princeton School'' to refer to the powerful point of view espoused by these two Scots. In the late nineteenth century and the early twentieth, philosophical academia was dominated by the Kantian-Hegelian point of view. Princeton philosophy finally joined in the Germanic chorus, contributing some important voices. Best known internationally was Norman Kemp-Smith, who came to Princeton in 1906. His commentary on Kant's Critique of Pure Reason, written while he was at Princeton, was studied wherever philosophy was taught. Archibald Bowman, who joined the department in 1912, lectured on Hegel, as well as Plato. Like Kemp-Smith, he was a Scot; neither could resist the call homeward, Kemp-Smith to Edinburgh in 1919, Bowman to Glasgow in 1926. A third member of this group was Alexander T. Ormond, one of the first Stuart Professors under McCosh, and the department's first chairman from 1904 to 1913. Still another was John Grier Hibben, a popular teacher and the last philosopher to be president of Princeton. The towering figure through these years was Walter T. Stace, who taught theory of knowledge and metaphysics; many of the best known philosophers in the United States in the 1970s were products of his teaching. Scoon taught Plato and Aristotle, and also Aquinas until the appointment in 1948 of the eminent French philosopher, Jacques Maritain. For forty-three years Ledger Wood upheld the tradition of scholarly competence in the history of modern philosophy. Spaulding kept alive philosophy's contact with the natural sciences. Theodore M. Greene vigorously represented philosophy's contact with the arts and humanities. Throughout the forties, the appointment of younger men was always made with an eye on balance. One of them, Walter Kaufmann, appointed in 1947 to teach modern European philosophy, achieved worldwide recognition in his field. But the forties brought losses with Spaulding's death in 1940 and Greene's resignation in 1945; and so did the fifties with Maritain's retirement in 1952 and both Scoon's and Stace's in 1955. It was clear that the future of the department depended on a series of major appointments. In 1955, Carl G. Hempel, one of the most eminent men in philosophy of science and theory of knowledge, was lured from Yale. In the same year, Gregory Vlastos, possibly the leading scholar of classical philosophy in this country, was called from Cornell. In 1963, Stuart Hampshire, one of England's foremost philosophers, came from the University of London. In 1967, Donald Davidson, whose work in ethics and the philosophy of language was becoming proverbial, came from Stanford. And, finally, Dana Scott was brought in 1969 to contribute distinction in the area of logic. It is little wonder that, by 1969, in a survey conducted by the American Council on Education, Princeton's Philosophy Department was ranked first in the nation in both quality of faculty and effectiveness of doctoral program. The department's continuing distinction has not rested solely on the eminent philosophers just mentioned. For one thing, not all remained. Hampshire left after seven years to become Warden of Wadham College, Oxford. Davidson left after three years to accept a post at Rockefeller University. Scott left after only two years to become a University Professor at Oxford. Much of the strength of any department lies in its younger members, and much of Princeton's strength in philosophy lies not only in the ability of these younger scholars but also in the breadth of their interests. As of 1977, tenured members of the department, by order of date of first appointment, were as follows: James Ward Smith, Political Philosophy; Walter Kaufmann, History of Philosophy; Arthur Szathmary, Philosophy of Art; George Pitcher, Theory of Knowledge; Paul Benacerraf, Philosophy of Mathematics, Richard Rorty, Metaphysics; Gilbert Harman, Philosophy of Language; Thomas Nagel, Ethics; Thomas Scanlon, Political Philosophy; Margaret Wilson, History of Philosophy; David Lewis, Metaphysics; Richard C. Jeffrey, Philosophy of Science; Michael Frede, Classical Philosophy; Saul Kripke, Logic and Metaphysics. From Alexander Leitch, A Princeton Companion, (Princeton University Press, 1978).